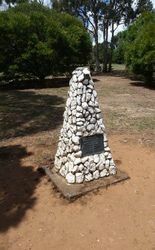 Cairn erect in 1967 by the Daylesford Historical Society to mark the 100th anniversary of the three lost children in 1867. Three children, William Graham (6 years 6 months) Thomas Graham (4 years) and Alfred Burman (5 years) wandered away on 30 June 1867 and were not found until 14 September 1867 at Musk Creek in the Wombat Forest. Three days after the disappearance at a public meeting over 100 horseman and approximately 600 pedestrians commenced an organised search. Aboriginal trackers and dogs were used but previous searches had destroyed any traces. Shops were closed for 7 days and large numbers of people searched before they were called off. A dog of a local resident found a boot with a child`s foot in it, and it appeared that the children had sheltered near a large tree and had died of exposure and lack of nourishment. Over 1000 people attended the funeral. Their Bodies Were Found At Musk Creek On 14th September 1867.